Last week, Blake launched our look back at 2011 with a highly insightful side-by-side statistical analysis of the USMNT offense under Bradley and Klinsmann. It’s not that we want to polarize fans on which one is the better skipper–we respect them both. We just thought it would be best to keep the change in management in perspective FFG style–with lots of stats! Indeed, when it came time to crunch those offensive numbers there were some surprising insights. Bradley, as it turned out, was much more productive by most measures. Despite all the buzz about Klinsmann’s more fluid, offensive approach to the game, the data just didn’t compute like that. Both Blake and regular FFG reader James concurred that Klinsmann’s propensity to plug up the midfield with holding mids and his use of a one-striker formation made it inevitable that goals would be hard to come by. As Blake mentioned in our offense edition post, we lost access to the the stats and chalkboards of the US/Mexico match under Klinsmann, so we weren’t able to perform that apples-t0-apples comparison that would have been so insightful. We know we have some of the most intelligent readers in futbol fandom and you will all make some important inferences from the data. We’d like to help you with a couple, however, by providing our own theories to explain some of the more striking differences. First notice that only 25% of the interceptions were in Costa Rica’s half. This indicates a low level of pressure from the Gringos. 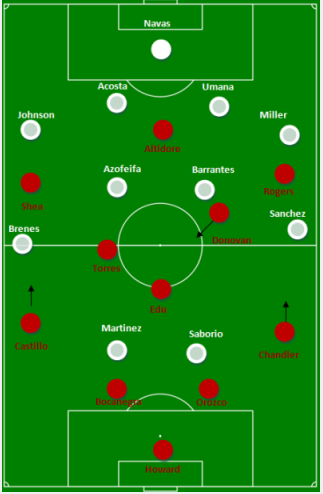 Instead, what appears to have happened is that the crowded midfield created by Klinsmann’s 4-2-3-1 (which included 2 holders in Edu and Torres) created a bottleneck that Costa Rica had trouble penetrating. When Costa Rica looked to long through balls to break through, our holders and center backs were able to step up and pick them off. What we failed to do, however, was transform those turnovers into productive opportunities. Which leads us right back to Blake, James and the offensive stats. Bradley was roundly criticized throughout his tenure (sometimes by us) for his rather dull, disciplined 4-4-2 and lack of imagination. It’s quite possible Bradley had simply come to accept that with the personnel he had available, no amount of formational tinkering was going to produce more consistently than his 4-4-2. Why, for example, can Arsenal play a 4-2-3-1, crowd up the midfield with holders, AND score goals? Of course it comes down to individual talent, but it is also a matter of an ingrained philosophy of fluid, possession futbol. Bradley seemed to have decided that a couple months a year wasn’t enough to develop a consistent team mentality. Klinsmann seems to have started his tenure with a long-term vision that it was. Castillo, Orozco and Chandler were all still pretty new USMNT options and Klinsmann continued his tinkering throughout the year. It must be noted, however, that Bradley’s more established and “experienced” back line conceded .5 more goals per game than Klinsmann’s experiments. In soccer, of course, that’s a pretty huge difference. Klinsmann’s defense conceded only 1 goal in 4 of its games and had one clean sheet. When your offense is clicking that’s a reasonable stat to work with! If Bradley won the battle of offensive numbers, it seems as though Klinsmann has tied things up. Do you agree? We’ve made our inferences on those defensive stats, but what do you think, Gringos? How can so many interceptions–the sign of a healthy and dominating midfield–not be turning into goals and opportunities? Given that Bradley’s side had more possession on average, I suppose it’s not too surprising that Klinsmann’s defensive numbers are generally higher. Still, the interceptions disparity is crazy (in a good way), and it makes me hope that Klinsmann is on his way to installing a ball-seeking, possession-based approach, at least when the US isn’t facing Spain or Brazil. I beleive what we are seeing are the results of Klinsmanns overall approach. His implamentation of an entirely new way of approaching the game when compared to Bobs way is in effect a challenge for the team. No I am not talking about the formations being used. I am talking about how for example the team is expected to apply pressure on the ball. It has always been there, but it is being applied in a new way under JK. Youve written about and used facts that demonstrate that the US was more productive under BB’s tenure than under JK’s. The numbers dont lie, however, I also take into account that our main players have been train to play the game a certain way for many years now. The defensive countering style was, if I remember right, started under Bora many years ago. Our main players are probably going through the most challenge under JK as they are truly coming at it from a differrent perspective. Everyone remembers the scene in “Titanic”,(lol) where the iceberg is spotted yet the ship does not react to the changes in steering that are made. The movie makes a point to inform us that something that big just cant change directions on a dime. I am simply implying that the US MNT players who have been trained one way for years now, will take a bit of time to make the neccesary changes that JK is requiring of them. Applying pressure on the ball much earlier than under Bradley has alaready shown dividends, as your stats point out. The offense will take a bit more time, which I am more than willing to wait for.